This was one of the best looks I saw at fashion week. Really cool coat and shoes combination. The cuffs on the coat and those marvellous shoes are to die for…and what about the extra high cuff on the trousers…yes,this gentleman gets my vote too! He looks great! 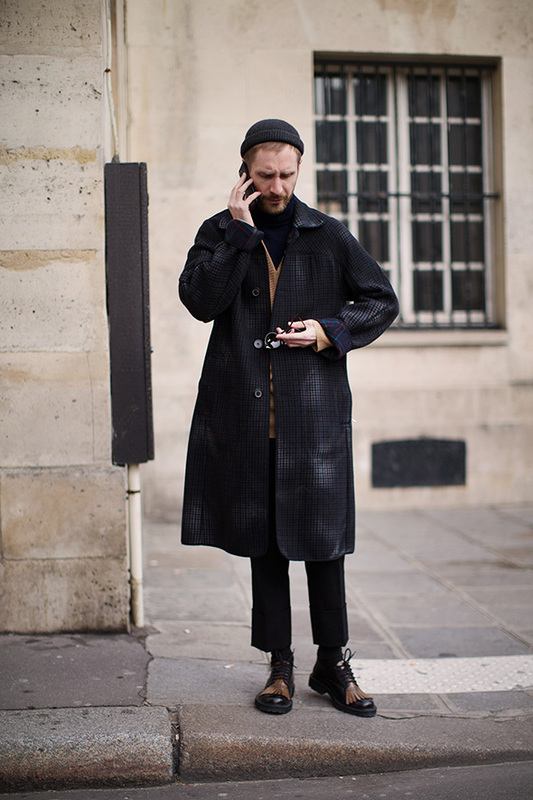 Compare this look to the guy with the long sloppy pants and coat from a couple a days ago….there is no comparison. Carole…I agree there’s no comparison what so ever to the sloppy Joe look! 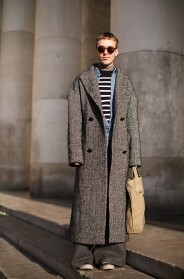 Another brilliant coat, super proportions, and the fading in and out check is interesting. The turned up sleeve gives a nice flash of colour. The trouser cuffs don’t float my boat, but he’s pulling it off. Agree! Especially those shoes!!! I don’t often lament the fact that I cannot fit a man’s shoe. These make me do that. Yes, very elegant and considered. A pleasure to behold. I totally agree, wonderful outfit, amazing shoes!